It’s because of Sleep Stages that we all have. Basically, you do not sleep the same all the time. There are different classifications, but most people agree that there are either 4 or 5 stages of sleep. The deeper stages are NON-REM, deep sleep where the body recovers. You cycle between stages, as this graph shows. Looking at the graph you can see that you initially drop down into the deepest stage of sleep. But this does not happen right away – you step down through the stages of sleep until you reach the deepest stage. This is VERY important if you are going to take a nap. 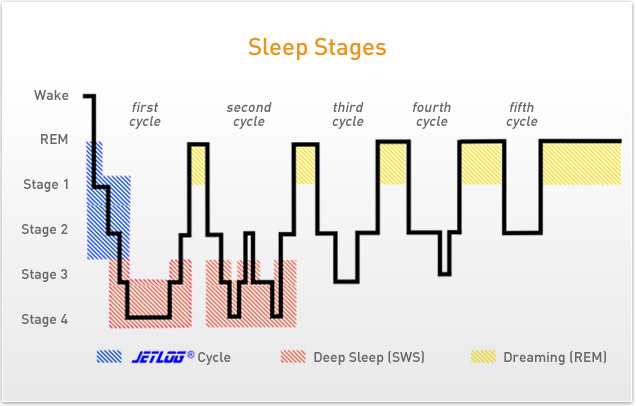 In this case, you do NOT want to enter the deep sleep stages (the red areas on the graph). How long it takes to reach deep sleep varies by individual, but a safe rule of thumb is 20 minutes: if you sleep less than 20 minutes, you will not be awakened from deep sleep. Being awakened from a deep sleep stage is what causes you to feel like crap. Your body thought that it had enough time to enter the serious recuperative stage of sleep, and now you are forcing it awake. Ouch. A better plan: if you plan to nap, set an alarm for twenty minutes after you lay down. That way you will not enter deep sleep, and you will actually feel refreshed after your nap. Adjust this time as necessary: I know people who can sleep for 40 minutes and wake up refreshed; YMMV. As for oversleeping, it’s essentially the same thing. Your body completes the normal sleep cycle (with lots of light, REM-sleep at the end), and you do not wake up. Eventually your body decides to enter another sleep cycle, and then you wake it up during a deep sleep stage. Again, ouch. Waking up from a deep-sleep stage makes you feel horrible. That’s it in a nutshell. Why do I know all this? Because I’ve flown airplanes all around the world for 15 years, and fatigue studies are part of the deal. Short, monitored naps are actually encouraged on long flights to helps pilots maintain their alertness. Hi it’s a while back since you posted this but just wanted to say it’s still the best answer of the first Google search page!